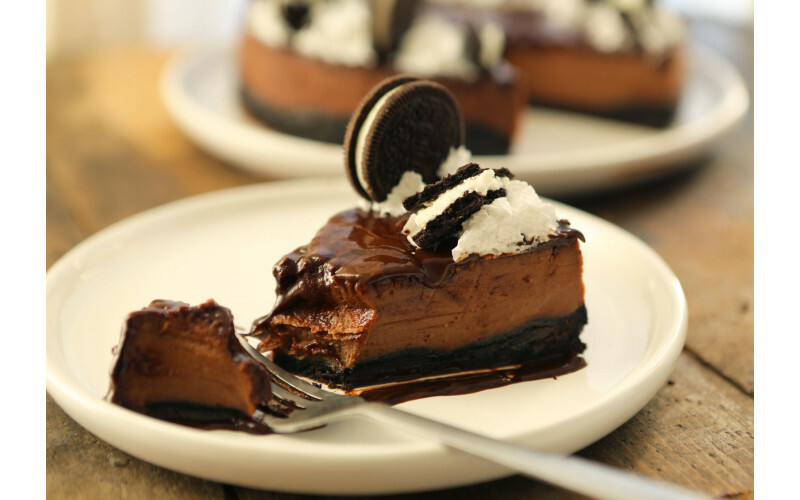 This baked chocolate Oreo cheesecake is lots of fun to make and to decorate and of course to enjoy afterwards! Get the kids involved... they'll enjoy bashing the biscuits up and decorating the cake with broken biscuits and squirty cream (or if you're a big kid, like most of us here, you'll love this part too!). Grease a loose bottom cake tin (20cm diameter and 7cm deep) with vegan spread. Blend the Oreo until fine or place in a clean tea towel and bash with a rolling pin. Gently melt the margarine and coconut oil in a small saucepan on a low heat until fully dissolved. Combine thoroughly with the blended digestives in a large mixing bowl. Empty the mixture into the greased cake tin and evenly distribute along the bottom and up the sides of the tin. Place in the fridge until you need it. Blend the ground almonds, cream cheese, coconut milk, sugar, flour, cornflour, lemon juice and vanilla paste until smooth. Melt the dark chocolate and coconut oil using a double boiler (a glass or ceramic bowl that fits on a saucepan of simmering water but doesn’t touch the bottom) and then pour immediately into the cake mix and blend. Take the base out of the fridge and pour the cake mix straight onto the base. Give it a bit of a shake to make sure the mixture is evenly distributed. If you would like to add raspberries to the cake mix, push them evenly into the mixture until they are fully submerged. Fill a deep baking tray with water (around 1 inch). If you are using a cake tin with a loose bottom, make sure it is really securely covered with foil before placing it into the water. Put the tray with the cake into the pre-heated oven and bake for 1 hour 30 minutes. When the cake is ready, take it out of the oven and leave it to cool for an hour before putting it into the fridge to set overnight. Once set, remove from the cake tin using a hot knife. Pour vegan chocolate spread all over the top of the cake (and down the sides if you fancy it). Decorate with squirty cream and Oreo biscuits.